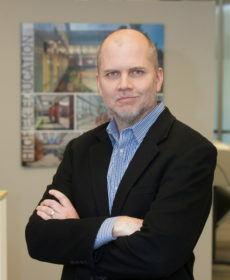 Steve leads our Charlottesville Studio with over 25 years of experience in the design of educational, civic, and residential buildings. Steve exemplifies a trait shared by the best of architects: the successful blending of “the generalist” with “the specialist.” The generalist in Steve was awarded a Master of Liberal Arts Degree at The Johns Hopkins University and has written a novel (albeit unpublished), a screenplay (albeit unfilmed), and a full length play for stage (albeit unproduced). As the specialist, Steve is a LEED Accredited Professional, has been credentialed as a Certified Construction Specifier by the Construction Specifications Institute, has written a regular intra-office memo regarding the coordination of contract documents, and has aided the National Council of Architectural Registration Boards (NCARB) in editing and establishing the “cut score” for the Construction Documents and Services portion of the Architectural Registration Examination (ARE). Born and raised in Baton Rouge into a family of LSU academics, and himself a graduate of the LSU School of Architecture, Steve sees family, solving problems through built space, and beating BAMA as central to a fulfilled life.